Only a few days left to participate in our canned food drive! Help ensure every family has a warm meal this season! 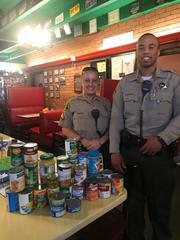 There's only a few days left to participate in Lancaster Sheriff's Station annual Thanksgiving and Harvest Food Drive! Our station will be collecting canned goods and other non perishable items through Tuesday, November 20th. Our lobby will be a collection point where residents can drop off any donations. During this season of giving thanks, help us ensure every family in the Antelope Valley has a warm meal to share. Please come by any time to drop off your canned food and non perishable items. Thank you to everyone that has already donated and for helping us make the Antelope Valley a great place to live!